I created this dish inspired by a Spanish tapas dish called ” Gambas al ajillo ” which is basically shrimp cooked with lots of garlic , olive oil, and lemon juice. 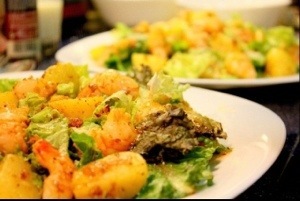 I used the shrimp to top the salad and the sauce for the salad since its got an amazing flavor once it’s all cooked together. One tip for this is – you want to slow cook the garlic in the sauce so it comes out soft and you don’t get the taste of burnt garlic. Nobody likes that ! The recipe I’m posting is basically how I made it – if you were to make it for a big group of people you would probably have to use more shrimp so it all depends on you. Boil the potatoes once they are soft you can put them aside and cut them into 4 if you are using medium sized ones. On medium heated pan add the olive oil with the shrimps cook them till the shrimp start to color then lower the heat and put in the garlic add salt and pepper / lemon pepper is also good and some paprika , then squeeze a lemon into the dish. Once the garlic is soft you may add the potatoes in there to get the flavor then turn off the stove and let it cool down. 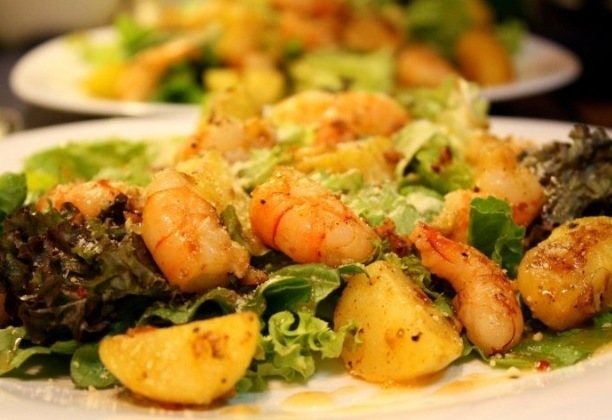 Make sure you have your greens ready so you can just top the salad with the shrimps and potatoes then finish it off with grated fresh Parmesan cheese. TADA !!! This dish is so easy you can make it in 10 mins. the only thing that might take a while would be the potatoes.